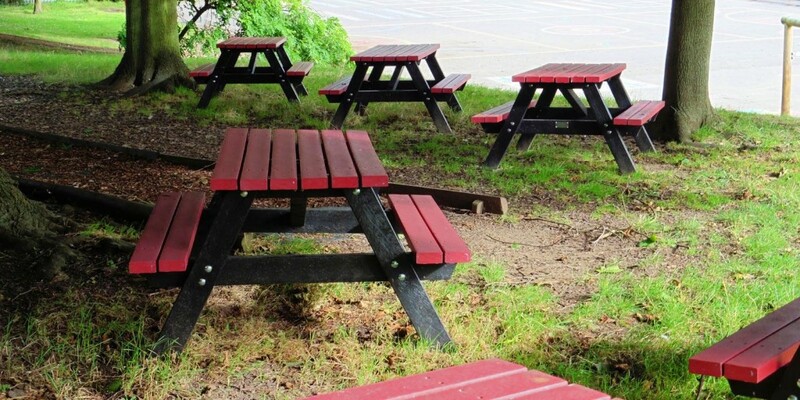 Looking for recycled plastic picnic tables? 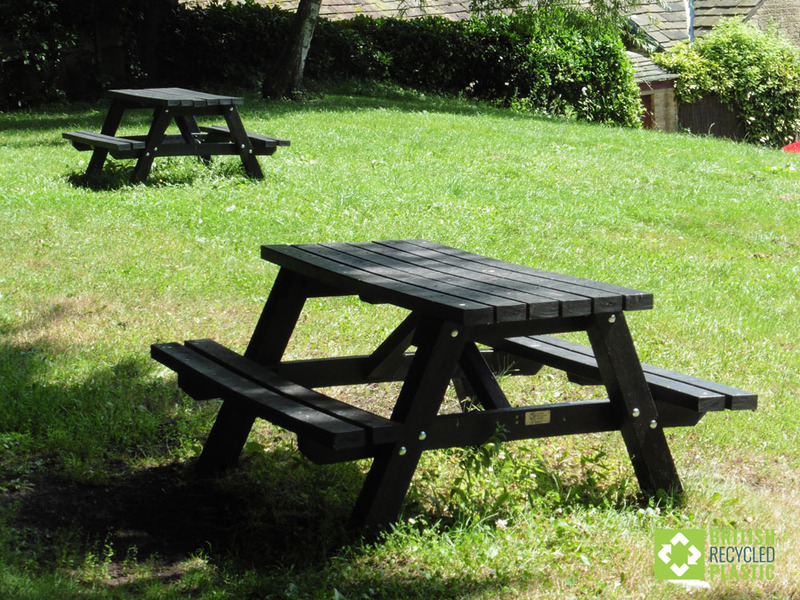 Picnic tables are possibly the most popular use of British recycled plastic. They often have to put up with huge amount of use and abuse, everywhere from schools, pub gardens, motorway service areas, staff rest zones, remote country parks and canal banks to domestic gardens and urban green spaces. 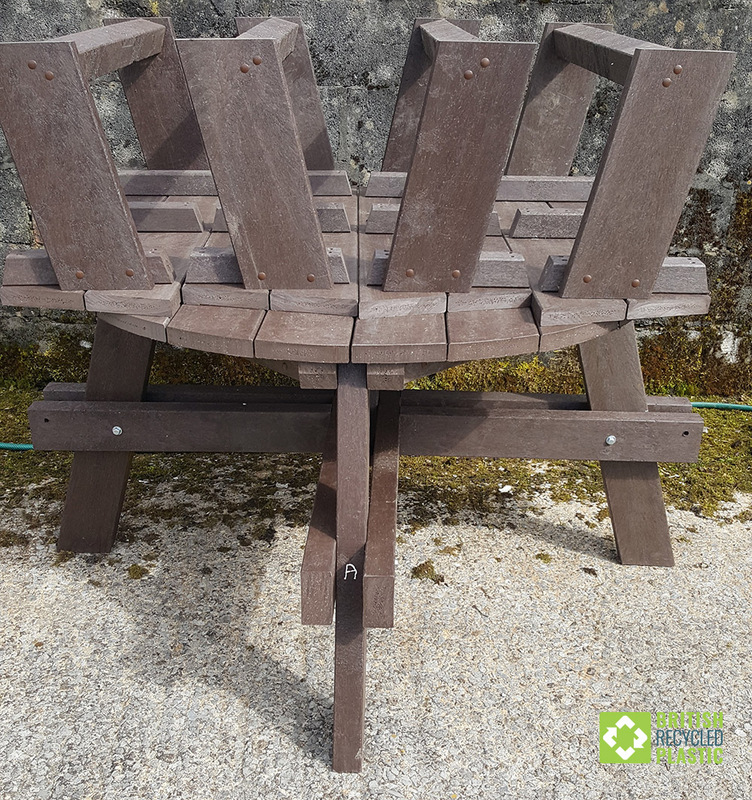 Being made from recycled plastic also means that they are maintenance free as the plastic will not rot or degrade in any way, whether kids are constantly clambering over them or they are being battered by the salty sea air. 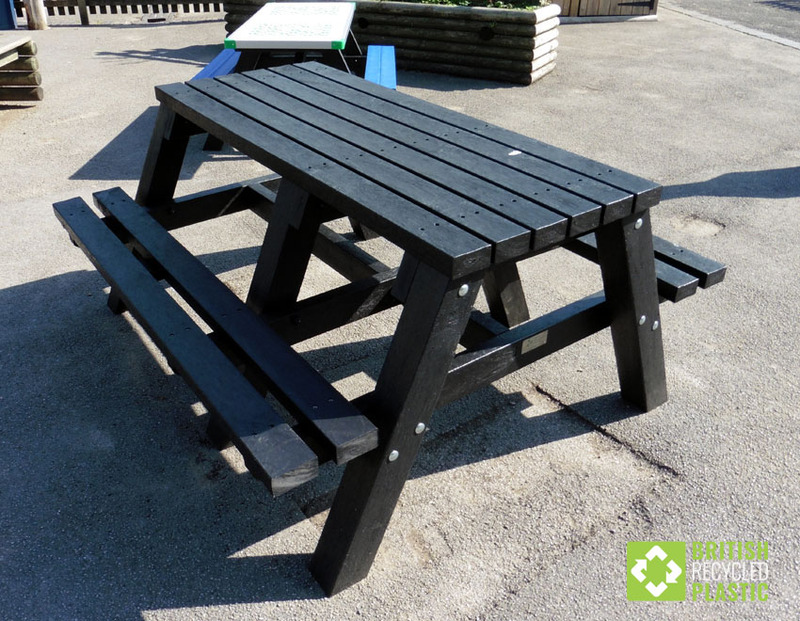 Many of our recycled plastic picnic tables are available flat-packed too, saving you money on the price and also saving you money on the shipping as they can be stacked more efficiently on pallets. 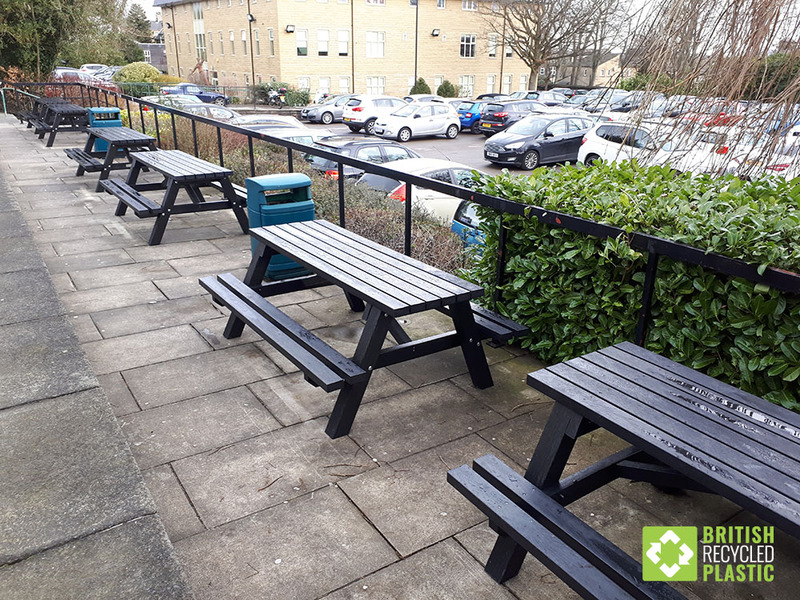 The regular Denholme is built to a traditional design and is our best-selling standard recycled plastic picnic table, as seen in hundreds of locations across the country, from schools to National Trust properties and village greens to factory comfort zones. Click here for a little more on the Denholme. Length 1.55metres – Height 78cm – Width 1.42m – Weight 110kg – Available flat-packed (up to 5 on two pallets) or fully assembled (up to 2 per pallet). Download a copy of the simple assembly instructions here. 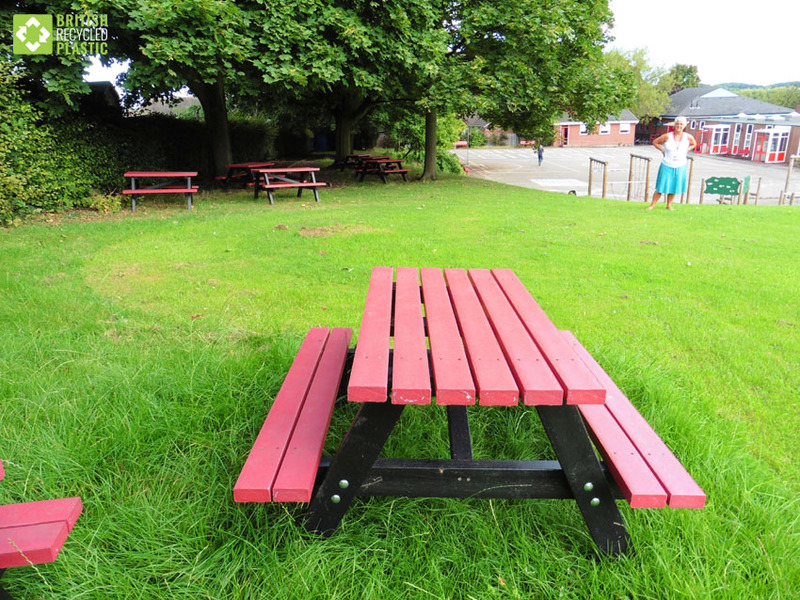 The Rastrick is our popular recycled plastic wheelchair accessible picnic table. Either end protrudes by an additional 400mm and is supported by hardened steel bracket. Read our case study of the Rastrick table here. Length 1.84metres – Available flat-packed or fully assembled. Click here to get the simple assembly instructions. 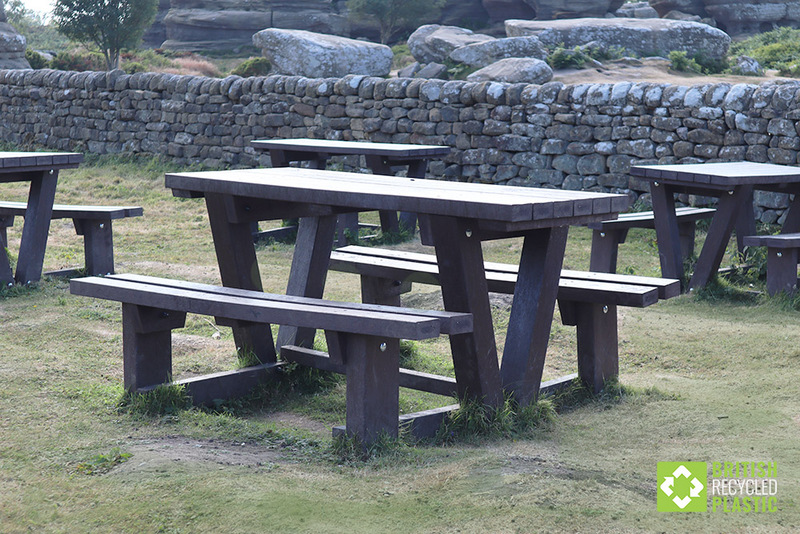 The Todmorden picnic table is one of our top of the line tables, bigger than the Denholme and braced with extra steel reinforcement under both the seats and the table itself. It can comfortably seat six full sized adults or eight kids. Click here for a further look at the Todmorden. Length 2 metres, weight 161kg. Like all of our furniture that can be supplied flat-packed, the Todmorden is easily assembled as you can see in these instructions. 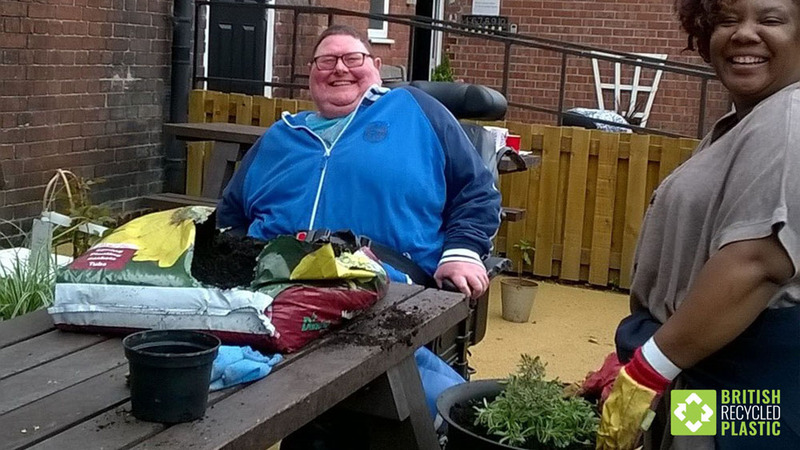 The Batley “walk through” picnic table is the perfect solution for users with mobility difficulties as users do not need to lift their legs over the seat to gain access. The Batley is available either flat-packed or fully fabricated. 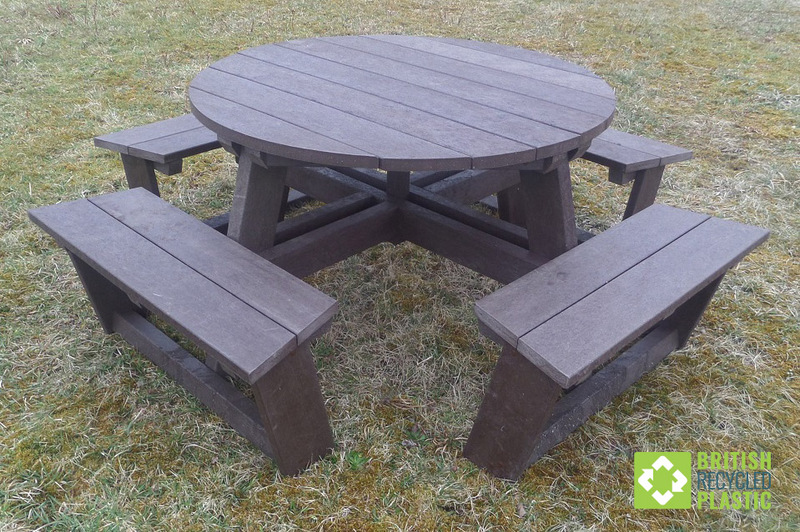 Download the assembly instructions for this popular picnic table here. Length 1.5 metres, weight 162kg. The Otley Activity Table comes with a variety of different game tops and can be supplied either full size (Adult) or at a lower height (Junior), more suitable for smaller children. Both are 1.5 metres in length with the Adult version weighing 115kg and the Junior version weighing 70kg. These tables are only available fully assembled. Similar to the full-sized Denholme, but a little smaller, many customers choose to have their school colours reflected in the tops and seat slats. 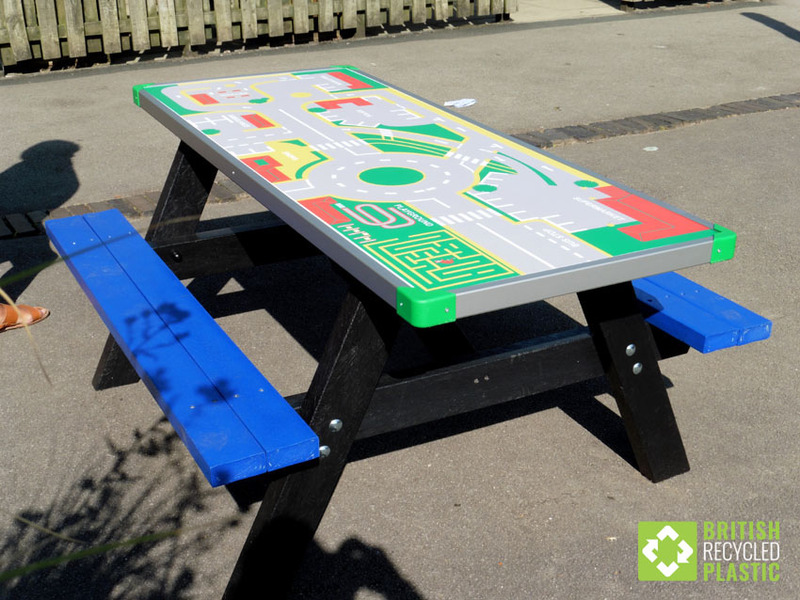 This picnic table is ideal for Infant or Junior schools. 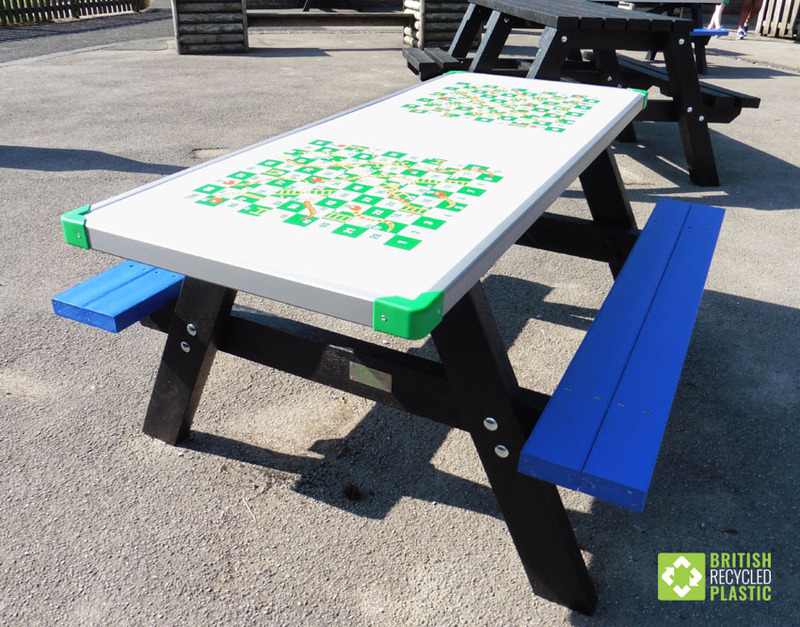 You can read a little more about our Holmfirth recycled plastic junior picnic tables here. Length 1.2 metres, Height 67cm, Width 1.14m, Weight 72kg. The assembly instructions for black and brown versions of this table can be downloaded here, whereas brightly coloured versions of the Holmfirth use these instructions. The Bradshaw picnic table follows the traditional wheelchair accessible design with half of the bench seat missing on one side. Please note that this is available fully fabricated only. Length 1.5 metres, weight 110kg. 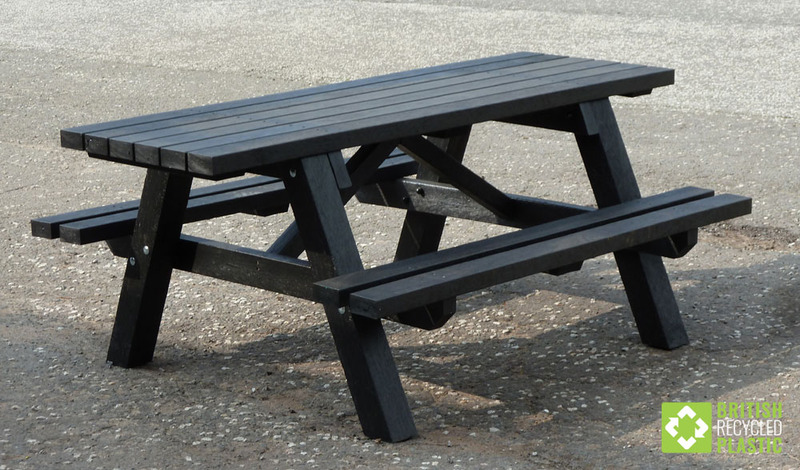 The Calder recycled plastic picnic table is currently the largest table in our range. Available with either a square or circular top, and the ability to seat 8 comfortably, the Calder can bring another level of usability to any outdoor area. 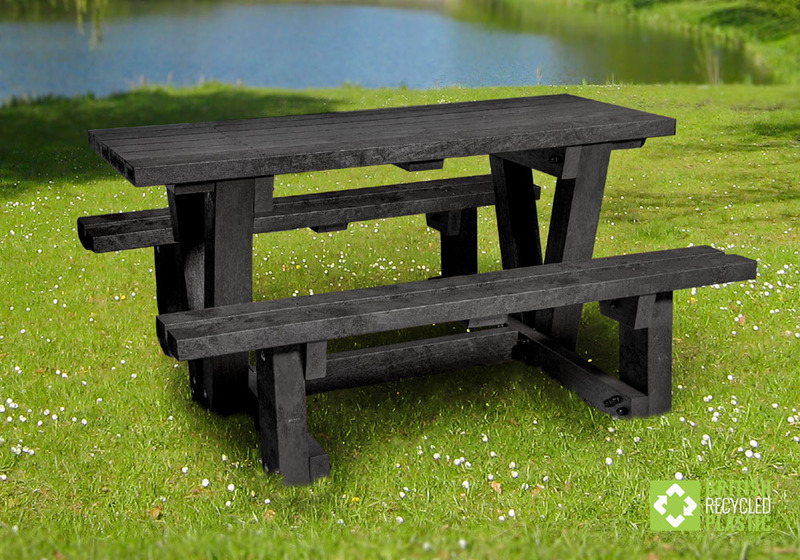 Extremely robust and able to withstand difficult conditions, this picnic table was redesigned in April 2018 and is only available semi-fabricated, as per the photo on the right. This means that we can now ship two on a double pallet, rather than each one needing four pallets of its own, creating huge savings for our customers. Table width 1.2 metres, overall diameter 1.89 metres, weight 150kg. 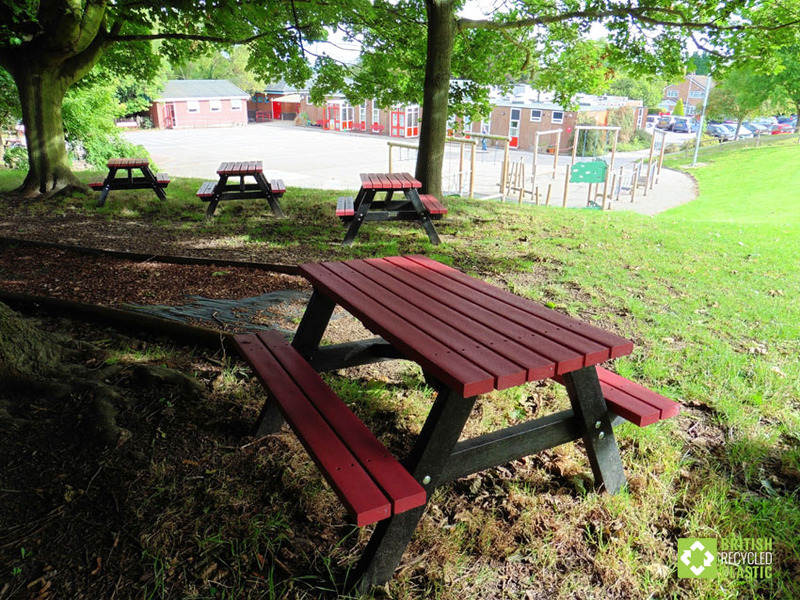 Most of our picnic tables, and benches for that matter, are available flat-packed to reduce the cost. They come with IKEA-style instructions, but this video below shows how simple they are to assemble. Once they’ve been delivered, how do I store the table parts before I start assembling them? How long do your picnic tables last for? Almost certainly in excess of 100 years, but we’re not sure about whether that means 101 years or 500 years. All that is “bad” about plastic is also “good” about plastic in this context. I want some for my school. Do you do discounts? Yes, we certainly do. 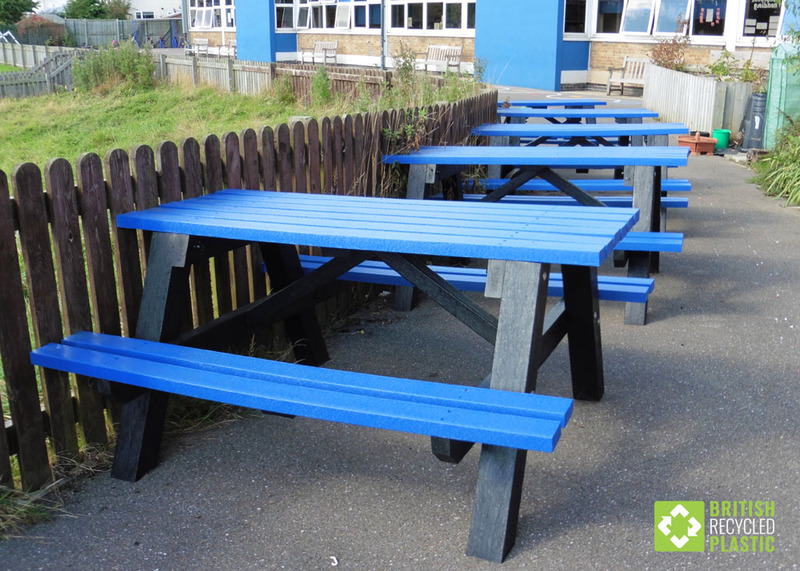 We offer discounts for purchases of 5+ pieces of furniture that was set up with schools in mind, but this same offer is also open to any organisation or company buying five or more picnic tables. Do they ever splinter? I am concerned about kids using them getting splinters. No, they will never split or splinter in any way. The wooden picnic tables we had were under the trees in the damp and started to rot in not much more than five years. 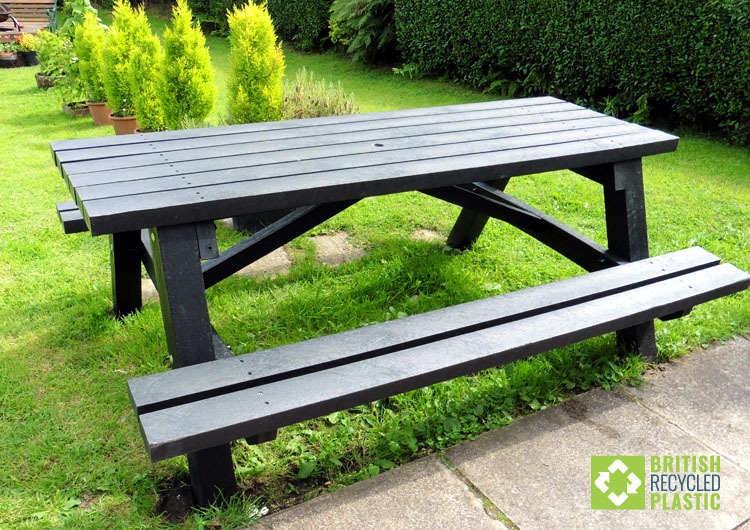 What guarantee will you give that your British Recycled Plastic picnic tables won’t do the same? We can unequivocally guarantee that our picnic tables will never rot. Not ever. They are chemically inert so there is absolutely no organic matter that can decay in anyway. How do I clean the picnic tables? You can give them a wipe down with a damp cloth every now and then. Some owners give them an annual blast with a jet wash, particularly if they are under trees where sap can get on them. Do they need to be fixed to the ground? It depends where they are really. They can weigh up to a quarter of a tonne (in the case of the Calder) so they are unlikely to be moved in most situations, particularly if they are behind locked gates, but just in case, we do offer both soft and hard ground fixing kits as optional extras. How are they transported and how much does it cost? 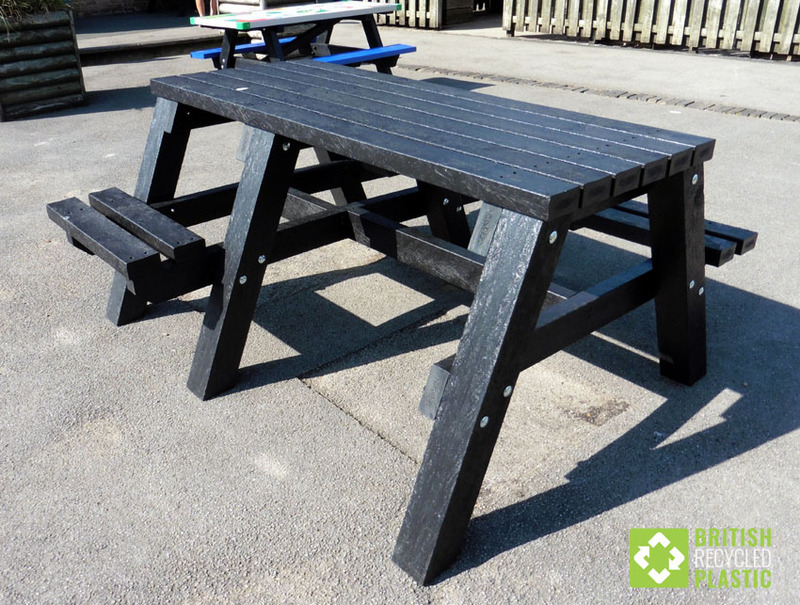 In common with all of our products, all of of our recycled plastic picnic tables are sent out via the national pallet network, strapped to standard 1000mm x 1200mm pallets. Most picnic tables go on two pallets and, if they are flat-packed, can be stacked five high on the same two pallets. If they are fully assembled then they can be stacked two high. Sending them to most of the UK costs £46+VAT per pallet, although London and places that are further away from the main areas cost a little more. You are also welcome to arrange your own transport. What colours are the picnic tables available in? They are either fully black, fully brown or with black or brown frames and seats and tops in any combination of blue, red, green and bright lime. Why can’t I have yellow? I’ve seen other companies do it. After a number of years experimenting with blends, we have found it very difficult to produce a consistent yellow plastic without introducing what, to us, is an unacceptable amount of virgin material into the mixture. This has led us switching to a bright lime colour, similar to that used on hi-viz jackets, as our alternative. So far, this has gone down very well with our customers. We are not in a position to comment on the amounts of virgin plastic used by other companies in the production of their yellow. Perhaps you can ask them yourselves.